Planning a trip over the long, hot summer? Why not head to Natchez, Mississippi and enjoy a little history while you are at it? Here are thirteen great places to visit while in Natchez…. 1. Linden's front door was copied for Tara of Gone With the Wind fame and has one of the finest collections of federal furniture found anywhere. If you elect to stay in this bed and breakfast your hosts will be the sixth generation of the same family to reside in this beautiful home. 2. Melrose is one of the homes I toured. It is owned by the National Parks Service and they give a very interesting tour there. Make sure you check out the cypress pond as you enter the drive and the rest of the surrounding yard has many gems waiting to be discovered. I recently wrote about the Melrose punka in the dining room. 3. Longwood is one of the saddest places I have ever toured, and while on the grounds I truly began to understand the tired old phrase “lost cause” when describing “the war”. I hope to write more about it in a few days. It is owned by the Pilgrimage Garden Club and is open for tours. It is truly a beautiful place and the picture with this post is of Longwood. 4. Dunleith has an interesting history and currently is a bed and breakfast. Make sure you ask about the names etched on the window panes. 5. Monmouth is one of the homes I actually got to visit in addition to Longwood. This home is also a bed and breakfast and has the most serene gardens I have ever walked through. Make sure you ask about the piece of furniture that helped the ladies keep the house after the war. 6. Rosalie sits on a high bluff overlooking the Mississippi River. The French settled this area before the English and built Fort Rosalie on the very spot where this great house sits today. During the Civil War Union troops occupied the house. Luckily they respected the great home and its contents. Today the home is owned by the Mississippi State Daughters of the American Revolution. 7. The Burn dates from 1834 and its original owner was the president of the Planters Bank in Natchez. The house misleads you from the front because it appears to only be a story or so tall, however, it is actually three stories tall and is surrounded by beautiful gardens. Yes, you can stay here too! 8. Pleasant Hill was the home of the founder of the First Presbyterian Church in Natchez as well as owner of a newspaper. 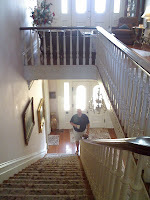 The house was built in 1830 and today operates as a bed and breakfast. 10. Want something a littler newer with a great view? Then Bluff Top is your choice. It was built in 1894 and overlooks a 200 foot bluff with great views of Ole’ Man River. 11. The Briars is IT when it comes to seclusion, beauty, and historical significance. In 1845 Jefferson Davis, future president of the Confederate States of America, married Varina Howell at The Briars. 12. 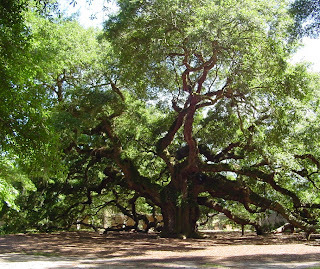 Glenfield Plantation sits on an original 150 acre Spanish land grant. Portions of the home date from 1778 while other sections date from 1845. No matter where you stand in this place you are standing somewhere old! Make sure you have the staff point out the bullet holes from the Civil War. 13. Oak Hill is a bed and breakfast. The home’s owners have won awards for their restoration of this 1835 antebellum home. If you love old homes then Natchez can’t be beat for beauty, elegance, and historic ambiance. This is week 25 for me! This is one of my next travel destinations if I have my way…..Where is it? Enjoy last week’s explanation here. Update: Here is this week's explanation! Thanks for participating. Back in the olden days after Pong and before Mario Brothers I loved to sit in various establishments with a cool beverage and play game after game of Centipedes, Asteroids, and Pac Man. I loved that noise the Pac Man game made as the little man raced around the maze eating up the dots….punka, punka, punka, punka and so on. So what’s my trip down memory lane have to do with last week's wordless entry? I've posted the image again with this post (see above). A punka is a wooden ( in this case mahogany) fan that was used over planter’s dining tables to keep the flies away as well as provide a cool breeze. The punka originated in India as was usually a palm frond type of fan or a piece of cloth that was waved ba ck and forth by a servant. I had heard about punkas but had never seen one until Dear Hubby and I toured a few homes in Natchez, Mississippi. They were lovely pieces of wood. Dear Hubby was quite alarmed by the punka at Merose when he noticed how heavy it must be and that was hanging over priceless antique table as well irreplaceable original china. One loose screw and…….perish the thought! 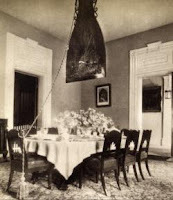 This picture (to the left) is an older picture of the Melrose diningroom with folks still lived in the home. One website mentioned that even as late as the 1940s former slaves would attend the family and pull the cord that powered the punka. 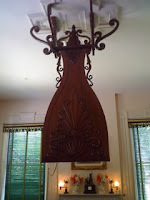 Here is a another view of the Melrose dining room....notice the cord hanging on the back of one of the chairs. 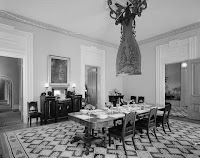 Below is a punka from a different Natchez, Missippi home....this image is the dining room at Linden. Punkas weren't exclusive to the Mississippi Delta either...this image is from a home in Virgina, but it appears to be made of cloth or possible paper. I’m knee deep in carnivals! The Georgia Carnival is up over at Georgia On My Mind. There are several good postings, however, don’t miss Griftdrift’s Innocence Lost, a three parter from his blog Drifting Through the Grift. It was very thought provoking for me and brought to mind many memories of my own elementary school days. Another stand out from the Georgia Carnival was Otter’s reading challenge. Most of us who read generally choose texts about things we like, things we agree with, and things that are within our comfort zone. What about reading to challenge our thinking? What about reading something that might challenge your views on a topic? I believe this is a worthy undertaking for everyone. Go check out New Notions 5 Reading Challenge-- -Join Now! over at Grasping for the Wind. This is Memorial Day weekend. Fellow Georgian, Miss Vickie from Beyond the Crossroads reminds us about the true purpose behind the holiday in her post, A Memorial Day Post With a Little Help. Finally, today was my last day with students. It was another challenging day, but we had no major problems. Awards were given out in our classrooms and students received their letter from me. There were lots of tears (students are ready for the summer, but suddenly realize vacation means goodbye) and cheers. I posted a link to my end of the year letter earlier this week, but you can link to it here. Another Georgia teacher, Terrell, at Alone on a Limb uses poetry to say goodbye to students. Check out his post here. Make sure you check out Terrell’s anthology of poems he shares with his fourth graders as well…..he posts a different poem each week. The 120th Education Carnival, hosted by I Thought a Think can be found here, and the 27th edition of Carnivalesque can be found here. It's all about Ancient and Medival history with a little archeology thrown in over at Aardvarchaeology. 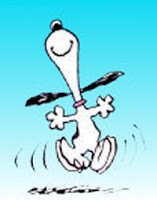 And yes………It was the last day of school, so I am presently doing the happy dance! Looking back I’ve not actually posted about education and my role within a school for several days. This time last year I was posting about discipline problems, frustrations, anticipation of a break to plan for the coming year, and kidding my husband about having eight weeks away from the classroom. However this May has been different. I’ve been writing about anything I possibly can dream up to avoid my fine profession, so here are some possible reasons why. 1. Momma said, “If you can’t say anything nice don’t say anything at all.” That kind of says it in an abbreviated version. Things have been tough lately in elementary world, and I just didn’t feel like airing my dirty laundry at the time. 2. My trip to Mississippi of course diverted me from my end of the year frustrations, and it has been fun so far to write about the things I saw. 3. I’ve been exhausted lately…..now that the big test is over students think school is over and how can we tell them otherwise when we have day after day after day of “activities” such as “Thank God the Big Old Test Is Over” Celebration, Career Day, Field Day, Accelerated Reader parties, and “You Have Amassed a Collection of 10 Great Behavior Slips Over a 9 Week Period” Party. I’m not knocking these these…..I’m just saying it’s hard to comply with an administrator’s directive to maintain order and structure when kids are are fliting about hither and yon. It makes for a crazy, confusing, exhausting day. One student had it right yesterday when he said….”When are we going to talk about history again. I miss it.” Gee little buddy, I do too. I showed my kids my Mississippi pictures today and we discussed how plantation owners lived. They were amazed. 4. Awards……Just like Santa I’ve been checking my list twice….trying to see who has been naughty and nice. I know to a non teacher type filling out award certificates seem like a no brainer, but this is a high stress part of my job. If I miss one kid…..if I misspell one name…..if I use a middle name instead of a given name…a given name instead of a nickname…..get the picture? 5. End of the year letter……I still haven’t printed these out. I must do this tomorrow. You can see my letter here. My letter is a tradition I have with all of my students. As of Friday 463 children will have received my letter. My high school intern was in my class when she was in the 5th grade, and she brought me her copy of my letter for my students to see the other day. They are now anxious to get theirs. I usually try to write a little personal note on the letters, and I hand them out when we are doing our awards ceremony in the classroom. I have 83 to complete by Friday. 6. I’m not sure why but Dear Hubby and I decided to begin yet another renovation project in the kitchen. Every dish, spice container, can of food, glass, and every other object in my cabinets is now spread about the house, and the cabinets are waiting patiently for a good sanding and paint job. 7. Test score analysis---------scores came in last week. Mine were great. I’ll post more about it later, however, as team leader I was asked to figure out our team’s high spots and low spots. I’ve been up to my elbows in long division and percentages…not my forte by any means. 8. A good portion of yesterday was spent taking up textbooks, checking them to make sure the numbers matched the ones I issued, and making sure there were no damaged pages. Loud Mouthed Boy better bring his math book to me tomorrow or I’m going to have to resort to filling out all sorts of required forms and will send home the letter informing Mom how much she owes. Why I have to go through this labor intensive exercise I don’t know…..Loud Mouth Boy’s Mom will never pay and it will never be brought up again. 9. Fights. Some kids have simply had it with each other by this time of the year. One of my sweet boys served three days detention because of a shoving match with another young man. Even our girls have had some problems. The stress of remaining vigilent every educational moment is draining the life right out of me. 10. Frustration……….We give awards for all As all year, all A/Bs all year, most improved, all As all year in each subject area, citizenship, and perfect attendance. We found out last week that administrators were directing us to make sure that every…..EVERY….student left school on Friday with an award. I cannot even begin to post here my opposition and total aversion to this practice. I am not alone in how I feel. Many at my school are also fuming. We began the year advertising the awards that would be available, and we discussed goals and benchmarks to reach the levels to receive these awards. I find it repulsive that the hard work of many students will be made so little of by also awarding students who have done only enough to get by. Do we think the children who work hard don’t notice this? As a parent I would consider it an insult if my child received an award they did not earn. I tell you….we had a hard time figuring out how we would meet the administrator’s directive. The main reason this is so hard to comply with is the directive isn’t to motivate those who didn’t make the cut……it is simply a diversionary tactic so that administrators can avoid those certain parent complaints that are inevitable as they wonder why there baby didn’t get an award for all As……gee, get a clue. Did you see any As on the report card all year? Where were you when we called you for a conference? Why did you hang up on me when I called to speak with you? 11. 178 days on the same roller coaster. I’m ready to get off the ride. 12. 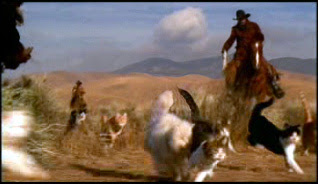 Herding cats….that’s what I have been doing for the last several days….and as I told someone today….we are attempting to herd a group of cats, and they are all distracted by a constant supply of lint blowing around on the floor. There is simply no way to maintain any semblance of classroom decorum at this point. Hmmmmm…….I wonder if I could manage to get everyone on the floor tomorrow, assume the lotus position, and chant for awhile. Ommmmmmmmmm…. Well, it was just a thought. 13. I’m tired, I’m brain dead, and I’m almost catatonic. I simply don’t have it in me to banter about educational issues because at this point I think I’m about as done as the cats, er……the kids. Two more days with students and three additional with administrators and then…..elementaryhistoryteacher will be doing the happy dance once again. I know what it is…..do you? Look for the explanation soon. My excitement grew as we took a left turn onto Klein Street. Suddenly we were decending a very steep hill and the road had turned from asphalt to brick. At the botton of the long hill I could see a very muddy looking strip of water. One of the main purposes of our trip was so I could see the Mississippi River, but something told me the muddy strip at the bottom of the hill was not ‘Ole Man River.’ Dear Hubby seemed to read my mind and was quick to point over the trees and to left as he said, “The Mississippi is over there.” I followed his finger and could see the swell of water that I was seeking over the tops of the trees. We came to a cross street with a bed and breakfast on each side. A wedding was taking place at the inn on the left and there was quite a crowd watching the bride and groom. We inched on through the intersection and then we saw our destination…..Belle of the Bends. DH turned into the drive and entered the code our hostess had given him earlier. The gate slowly swung open and we inched through the iron gate and slowly rolled down the drive. On one side was a beautiful hedge and on the other was a bank blanketed with the prettiest green vine that was so thick you couldn’t see the ground underneath. We parked at the back and before we could take a step or two Mary, our hostess, was already walking towards us with her arm outstretched to shake our hands. The back garden was simply lovely. The first thing we noticed was the largest Crepe Myrtle we had ever seen surrounded by the most intriguing green plant with brownish rust streaks. 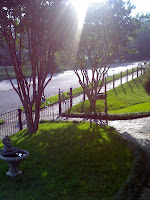 Later I discovered the plant surrounding the Crepe Myrtle is called Ironwood and the Crepe Myrtle is over 160 years old! 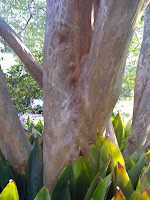 This image is a close up of the trunk of the Crepe Myrtle. Small hedges…perhaps Boxwoods…along with brick pavers formed crossing paths in the back along with a bird bath filled with Petunias and a lovely “Bird Girl” statue from Midnight in the Garden of Good and Evil fame. The back garden has simply too many wonderful finds for me to mention here, and I did not have time or storage space on my phone camera to take as many pictures as I wanted to but it was simply wonderful to walk the brick paved paths. *the house originally looked out over the Mississippi River, however during the same year the house was built the Mississippi eroded through DeSoto Peninsula and cut a huge channel during a flood, and this totally diverted the huge flow of the Mississippi away from the port of Vicksburg. Residents woke one morning to find their river gone. Can you imagine? Another amazing fact about the Mississippi is in 1812 an earthquake called the New Madrid (after the faultline) Earthquake was so strong it caused the river to flow backwards for a time. Some folks get these two events confused, so that’s why I mention it here. It took several years for the Corp of Engineers to complete a canal so that the Yazoo River could be diverted down the old Mississippi River bed connecting the port of Vickburg to the great river. *Everywhere you look in the home you find lovely antiques…many original to this fine home that has only had five owners in the 131 years since the home was built. The carpet in the main hall and down the staircase is one of the same patterns that was installed on the Titantic. *Double porches wrap around one side of the home and there are seating areas scattered throughout. DH and I loved the hanging wicker swings. We could sit and look out towards the Mississippi River. It was great. I grew up in a home with a wide, wooden front porch and the Belle’s porches brought back many childhood memories as I walked across the painted wood that had been warmed by the hot sun all day. It feels so good to your bare feet. There is nothing like a warm southern evening on a front porch. 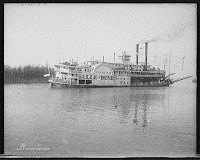 *The house was named for the steamship, Belle of the Bends, that carried Teddy Roosevelt to Vicksburg in 1908. *All rooms have 13 ½ foot ceilings and the doors are a remarkable 10 foot in height. *The main floor is embellished with double crown moundings seperated by a strip of the lovliest Bavarian plaster carvings I have ever seen. Also all windows and doors throughout this gem of architecture are surrounded by double mouldings of cypress that curve at the top. These embellishments are unique to this home. *There are four very different rooms upstairs for vistors. 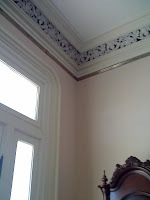 DH and I stayed in the River Scene room and slept on a bed made in 1840. Actually, there are beds that are even older than the one we slept in at the Belle….At the end of our stay Mary gave us an extensive tour of the entire mansion and every room was beautiful and each have their own bathroom, heart of pine floors, and lovely carpets spread throughout. As we went to bed the first night I literally climbed up on the bed (at one point it was a controlled roll) I wondered aloud about the people who had lived in the house and all of the interesting stories the house could probably tell if it had the power to talk. DH and I pondered over this as we munched on our chocolate covered strawberries “someone” had left on our bed when it was turned down for us. *Breakfast was at nine each morning. 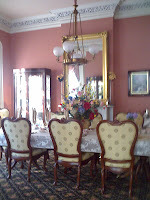 The dining room at the Belle is the most inviting room in the entire mansion. The large table, comfortable chairs, and presentation of food and dishware are exqu isite. I was reminded of the wonderful meals that sparked interesting conversations at Thomas Jefferson’s Monticello as we breakfasted the second day. Conversations centered on our occupations, history, politics, the state of the South, and of course, education (guess who brought that up?) Each morning we had interesting fellow guests to dine and conversate with as well as our hostess. It was a pure pleasure to meet a wonderful nurse practicioner from Mississipppi the first morning and a lovely couple from Texas the second morning. Mary spared no detail with her table setting and amazingly it was a little different the second day. We navigated several plates, pieces of silverware, and stemware each morning. The second day we even had our own individual cut glass butter dish with domed cover. Oh my! Mary did a perfect job of making everything so elegant yet so simple for those of us who are not high born. My non-Mother’s Day/birthday breakfast was Eggs Benedict my absolute all time favorite. In my thank-you note to Mary for our stay I told her she and her husband had done a mag nificent job of making their home livable yet they have maintained the historical integrity of their home. Belle of the Bends is an American treasure and they are truly blessed by God to be her caretakers. It was simply the most amazing place to make our headquarters as we walked in history’s footprints over Mother’s Day weekend. On your next trip to Vicksburg make sure you stay at Belle of the Bend and be sure you tell Mary I sent you! Follow the link above or here to see more of the Belle. There will be more pictures this week and I will detail our jaunt through Natchez as well. 1. The trip to Vicksburg was a gift from my husband for my birthday (May 13th) and Mother’s Day. 2. We left the Atlanta area Saturday morning and returned late Monday afternoon…a quick trip, but sometimes those are the best. 3. There was a hidden reason for the trip….I was running from Mother’s Day. Some of you may remember Dear Sister and I lost our mother after a very long illness last July. This was my first motherless Mother’s Day. I just didn’t want to sit through the church sermon this year. 4. Why Mississippi? Why not? I had never seen the Mississippi River. All I can say is WOW! 5. Dear Hubby made all the reservations and arrangements. He did a fantastic job. We stayed at the most interesting and beautiful bed and breakfast built in 1876, and we slept in a bed older than our ages combined. 6. The trip out to Mississippi was spent talking and talking and talking. Sometimes married folks just need to turn down the radio and talk. We have several renovations going on in our home presently (mainly because we can’t seem to finish anything we start), and most of our talk centered around that and of course, our kids. 7. Dear Hubby and I have decided the roads in Alabama and Mississippi are not as drivable as Georgia even though ours are in a perpetual state of construction or repair. We rode through terrible sections in Birmingham and in Meridian…..it would have been smoother if we had been rolling along on a rickety wooden wagon. However, the scenery along I-20 is much prettier and much less commericial in Alabama and Mississippi. 8. Yes, we visited a casino while in Vicksburg. We spent about three hours playing around. Dear Hubby went one way and I went another. The din of the machines was incredible. The strangest collection of whirs and hums I had ever heard. We experienced it, but I have no desire to return. Too much smoke…..too many people who looked like they didn’t need to be there. If I’m going to blow a wad of cash I can think of many more interesting ways to do it than to return to a casino. 9. For most of the weekend we walked in history’s footprint, and it was an incredible experience. We saw and toured beautiful homes, took in the local scenery, and had some very nice meals. 10. Upon arriving at the the Belle of the Bends, our bed and breakfast, our hostess showed us to our room and inside waiting for me was a huge bouquet of flowers and champagne Dear Hubby had ordered (I think I’ll keep him). We drank the entire bottle before heading off to explore, view the Mississippi, and have dinner. The picture I have with this post is the fire place in our room along with my flowers. 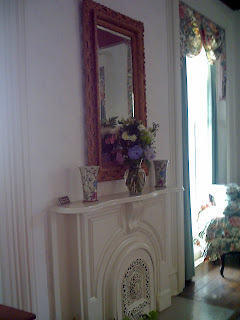 The mirror above the fireplace is original to the home. 11. We didn’t do too much touring in Vicksburg. We saved that for another trip. 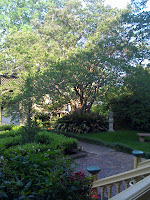 We ate at Borello's the first night and Cedar Grove Inn the second night in their courtyard dining room. We had been so busy touring places all day I had forgotten it was my birthday until Dear Hubby said something about it while we shared a piece of cheesecake at the end of our meal….and Mother’s Day had been forgotten except for the phone calls from both of our kids and the phone calls made to Dear Hubby’s mom and my step-mother. 12. Coming home we discussed Shelby Foote, the writer. We couldn’t agree on where he was from, so we did what any 21st century couple would do as they are driving down the road. We yanked out ye olde Blackberry and did a quick Internet search……Mr. Foote was originally from Greenville, Mississippi. Dear Hubby, as usual, was correct. I feel in love with Shelby's Southern drawl the first time I saw him doing commentary for Ken Burn’s Civil War. I miss seeing him/hearing him from time to time. We still have his body of work, however. It will endure as many of the things I saw over this past week will as well. 13. When I returned to school yesterday I received the customary hugs from a few who said, “We are soooooooo glad you’re back.” I told my classes I had been on a field trip of sorts gathering information to share with them. 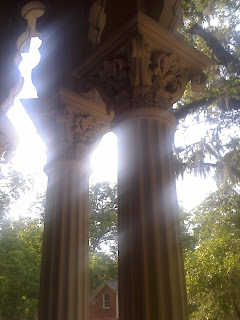 I told them about the mansions I had walked through that were so beautiful... yet so sad because they had all been financed with money made on the backs of slaves. I’m desperately trying to get all of my pictures together so that I can share them here as well as share them with students since we are finishing up our unit on the causes of the Civil War. Currently I'm trying to craft a proper thank-you note to our hostess, Mary, at Belle of the Bends. She made our stay so enjoyable. We were so sad to leave and rejoin our life in progess. So stay turned, and I will dole out tidbits of our trip and what I learned over the next few days. Bear with me as I attempt to do each bit of history justice and attempt to tell the stories in a proper way. I haven't posted in several days. I'm sorry. Life is hectic around here during the last few days of school. Lot to do finishing up awards lists, managing to get through one career day and one celebration day to celebrate the fact that we got through the state testing. Both occaisions were hot and rowdy days. Field Day looms before us next week. Various grade levels are spread out over three days which means I won't have a planning period for three days straight. Oh joy! At a time when I had several things to do online the computer decided to disrespect me. It actually froze up. Dear Hubby and I were ready to throw in the towel when suddenly it began working like nothing had ever happened. Dear Son surmised I just simply needed to give the tired keyboard a much needed rest. At any rate the timeline of history around here froze a bit and for that I apologize. History blogging will resume shortly, I promise. However, first......I'm off to Vicksburg for a much needed quiet weekend where Dear Hubby and I will wallow in the historic homes of The Great River Road, the Natchez Trace, and of course, the Mighty Mississippi. We had planned to visit Savannah, but in case you haven't heard Georgia has been experiencing a major forest fire in the southern region ( it has now crossed the Florida line). We were concerned about smoke, and then tropical storm Andrea blew in. At one point this week it was reported Savannah closed the harbor because of nine foot waves. We decided to head west instead. So....many thanks for all the visits and comments. Regular posting will resume in a couple of days and I promise to detail every history-filled minute of my travels. I’ve been quite remiss about adding certain places to my blogrolls I display here. I really should be doing spring cleaning around here…..you know….checking all the links and making sure they are still valid, and deleting those that haven’t been updated in months, and months, and months. Classroom duties come first, though, and for the next fourteen days my attention will be elsewhere. I have managed to finally get a few additions made. Check some of them out. This category is for history teachers at all levels and history sites, however, I know I still have some history teachers mixed in with my education links, so make sure you check those out as well if you haven’t already. This is a new blogroll that I began over at Georgia On My Mind since it is a blog about a particular state. I hope to “grow” this list in the near future. This is also a new blogroll and it will be one of my projects this summer to add sites I’ve already mentioned etc. Old Pictures What a resource! 80,000 pictures from the 1850s to the 1940s. The Futures Channel There’s no history that I can see at this site, but it’s great for science and math videos. So there you have it….you may already know about these or maybe you have discovered something new! During class change I meet students at the door and asked them to take their seats and read the message on the board. Students enter the room to find the desks arranged in a large square. In the center of the square I have measured off a large rectangle on the floor with masking tape. Mr. Janitor Man doesn’t like for me to place tape on the carpet, but sometimes I’ll sacrifice his ire when I’m trying to make an important point with students. The rectangle I’ve created on the floor measures four by ten feet. Observe the space that has been created by the tape. Imagine for a few minutes your family is in the process of moving out west….to Oregon, Washington, or Idaho. The rectangle on the floor represents the cargo container that your family will have to pack their things. It is obvious everything in your home cannot be moved with you. You can only stack things as tall as the line I’ve drawn on the board (about four to five feet). Take the next ten minutes and create a list of things you think is important for your family to pack. Remember….this is the only container your family has. Everyone’s things will be in the container together. Students furiously write for the next few minutes creating a list in their notebooks. I finally call time and ask a few students to volunteer items from their list. They volunteer things like their Ipod, their Xbox, Cds, and television. No one includes food, or tools, or any other basic supply. I ask students to read through their list and take off anything that would not exist in 1843. All of a sudden many lists shorten greatly. Some disappear all together. Every now and then I think a jolt of reality is important for my students. They get lazy and tend to think of historical events and historical figures in their own frame of reference. While it is beneficial to compare and contrast our way of life to the way of life during a time period being studied it is also important to attempt to look at the time period from the perspective of those living at the time. So what would you need if you were about to embark on the Oregon Trail as many thousands did between 1843 and 1870? You can see a more completed list of supplies with time period prices here. The wagon space was tightly packed. Most everyone walked the entire trail since every bit of space was needed and folks wanted to spare the oxen as much as possible from the extra weight. One in every ten people who traveled the trail died. Many died from accidents such as guns accidentally going off and getting crushed by wagons. Others died from disease such as cholera. An interesting interactive map of places along the Oregon Trail can be found here. The Education Carnival is up over at Dr. Homeslice. The History Carnival is up over at Clioweb. And….the Georgia Carnival is up over at Grasping for the Wind. Go read. Go read now. I could go a thousand different directions with this. What will I post about? At a fundraising dinner for a school that serves learning-disabled children, the father of one of the students delivered a speech that would never be forgotten by all who attended.After extolling the school and its dedicated staff, he offered a question: "When not interfered with by outside influences, everything nature does is done with perfection. Yet my son, Shay, cannot learn things as other children do. He cannot understand things as other children do. Where is the natural order of things in my son?" Shay and his father had walked past a park where some boys Shay knew were playing baseball. Shay asked, "Do you think they'll let me play?" Shay's father knew that most of the boys would not want someone like Shay on their team, but the father also understoodthat if his son were allowed to play, it would give him a much-needed sense of belonging and some confidence to be accepted by others in spite of his handicaps. Shay struggled over to the team's bench and, with a broad smile, put on a team shirt. His Father watched with a small tear in his eye and warmth in his heart. The boys saw the father's joy at his son being accepted. In the bottom of the eighth inning, Shay's team scored a few runs but was still behind by three. In the top of the ninth inning, Shay puton a glove and played in the right field. Even though no hits came his way, he was obviously ecstatic just to be in the game and on the field, grinning from ear to ear as his father waved to him from the stands. In the bottom of the ninth inning, Shay's team scored again. Now, with two outs and the bases loaded, the potential winning run was on base and Shay was scheduled to be next at bat. However, as Shay stepped up to the plate, the pitcher, recognizing that the other team was putting winning aside for this moment in Shay's life, moved in a few steps to lob the ball in softly so Shay could at least make contact. The first pitch came and Shay swung clumsily and missed. The pitcher again took a few steps forward to toss the ball softlytowards Shay. As the pitch came in, Shay swung at the ball and hit a slow ground ball right back to the pitcher. Instead, the pitcher threw the ball right over the first baseman's head, out of reach of all team mates. Everyone from the stands and both teams started yelling, "Shay, run to first!Run to first!" Never in his life had Shay ever run that far, but he made itto first base. He scampered down the baseline, wide-eyed and startled. Everyone yelled, "Run to second, run to second!" Catching his breath, Shay awkwardly ran towards second, gleaming and struggling to make it to the base. By the time Shay rounded towards second base, the right fielderhad the ball ... the smallest guy on their team who now had his first chance to be the hero for his team. He could have thrown the ball to the second-baseman for the tag, but he understood the pitcher's intentions so he, too, intentionally threw the ball high and far over the third-baseman's head. Shay ran toward third base deliriously as the runners ahead of him circled the bases toward home. As Shay rounded third, the boys from both teams, and the spectators,were on their feet screaming, "Shay, run home! Run home!" Shay ran to home, stepped on the plate, and was cheered as the hero who hit the grand slam and won the game for his team. 1. Forget about this story….it doesn’t have a thing to do with you. 2. 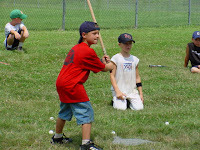 Connect the example set by the baseball players to the relationship you have with each and every unique student and allow it to make a difference in your teaching. This story was sent to me through an email. You may have already seen it, but I felt it was important to share.